There's a difference, with regard to pickle making, between what I would tell you and what I should tell you. The dichotomy is born of liability issues related to food safety. What I should tell you is what won't get me sued, even if it means you get soggy pickles. What I probably shouldn't mention is what I do in the privacy of my own home, where the occasional rule is carefully bent in service of crispy pickles. The pickles in question are a mix of carrots and peppers. I've been making, sharing, gifting and trading them for so long that in my food-hood they're often referred to simply as "Ari-style pickles." These pickles are not only a cornerstone of my diet, they represent a year-round umbilical cord to summer. I use them strategically to complement the flavor of each mouthful; they add spice, acidity and local terroir, and are perfect for pairing with rich, fatty foods. In a procedure I call co-munching, I take a bite of the meal and chase it with a nibble of pickle to adjust the acid and spice. Co-munching with pickled peppers is like adding a dash of hot sauce and a sip of wine to your meal. Like an aboriginal hunter utilizing every bit of his kill, I use the entire contents of my pickle jar. Once that jar is emptied of its veggies, I use the vinegar in salad dressing and make mustard from the vinegar-soaked mustard seeds at the bottom of the jar. I make roughly a hundred quarts of pickles every season. That may seem excessive, but a dinner party can wipe out a whole jar in a single night. I'll give some away and trade a bunch, too. If I'm left with a jar per week for normal consumption, I'm in good shape. I used to cut my carrots into long spears and leave the peppers whole, but I've found that I can get more stuff into the jars if I slice both carrots and peppers into rounds about half an inch thick. 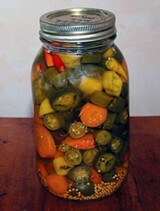 Jalapeños are the ultimate pepper for pickling with carrots, but other spicy, thick-fleshed species work too, such as Louisiana, Arledge and señoritas. If you're unfamiliar with canning, or with any of the canning terms that follow, read the directions that come with the Mason jar lids. You'll need a big kettle and some rubberized jar tongs for pulling the finished jars from the water. All of your equipment and your work environment should be kept clean, and your Mason jars, lids and rings should be sterilized before anything goes in them. Again, the lids will come with instructions on how to do this. Add a teaspoon of salt and a tablespoon each of yellow and brown mustard seeds to the bottom of each quart jar. To make Mexican-style peppers and carrots, aka escabeche, add a tablespoon or sprig or two of oregano as well. Pack your washed and sliced peppers and carrots into jars as tightly and space-efficiently as possible. Be sure to leave a one-inch "headspace" between the veggies and the top of the jar. When the jars are packed, place the sterilized lids on them to keep out the invisible rain of microscopic riffraff. If you follow the USDA guide to canning, you'll see the agency recommends a brine of pure vinegar, rather than vinegar mixed with water. This will increase the acid content and further reduce the risk of spoilage but makes the pickles too vinegary for my taste. If you follow this road, consider increasing your sugar content. My brine is a 50/50 mix of vinegar and water, with the vinegar portion being equal parts cider and white wine vinegar. I'm not saying you should try this at home. I'm just sayin'. Heat your brine and add sugar to taste, a little at a time until it softens the edge of the brine but doesn't actually taste sweet. I use about half a cup of sugar for each gallon of my non-USDA-compliant brine. When the brine reaches a boil, I turn the heat off and pour it into my packed jars. I pour it slowly so the hot liquid doesn't crack the glass jars, and cover the veggies with half an inch of brine so that another half-inch of headspace remains. Wipe the rims to remove any errant mustard seeds or oregano leaves, and then screw on the lids and rings. With canning tongs, place the hot jars into a kettle of boiling water deep enough to cover the jars by at least an inch. It's good to do this right away so the jars are still warm from the hot brine you just added when they enter the water. Once the water in the kettle returns to a boil, I let the jars process for five minutes and then remove them. The USDA says to put your veggies in the brine pot before you boil it, so they cook in the brine before going into jars. After packing and sealing the jars, according to the agency, you should then process for 15 minutes (unless you're at sea level, in which case 10 minutes is enough). After all of that cooking, your carrots will be soft enough to sip through a straw. But at least you can't sue me for that. I feel comfortable taking on the extra risk of undercooking and under-vinegaring my pickles because I rely on home canning's most important rule of all: Don't eat from any jar that has lost its seal or whose lid does not display the telltale concavity that indicates a vacuum in the jar. If the lid is bulging or has lost its seal, toss the contents. Period. It's that simple. Don't ever bend this rule. After removing your jars from the water, you'll be serenaded by a jazz concert of pings as the lids seal, one by one. This music will be followed by a year-long encore of lip-smacking as you and your friends co-munch your way through summer's pleasures. So sue me.